Sorry angel but she is very old, I’ve had her for years & she moves about to a different place every year. Today it’s the dining rooms turn. We are having a proper roast dinner tonight with beef, Yorkshire pudding etc etc. Our last full family meal before Brian & Lesley go home. I have the table laid & all veg done, meat & roast potatoes in the oven so just a lull now before everyone arrives. Only Lydia & Mathew missing as they are in Newcastle. 1. We lasted until after midnight last night! 2. Wonderful impressive firework display along the Thames.....we are still a major country ready to take on anything! 3. Beautiful walking weather....I went nowhere but Harry had a walk this afternoon. Enjoy your last evening meal. She’s lovely. Yorkshire pudding! Oh my! Enjoy your day with your loved ones! @huvesaker That’s what I always feel, once you get out it’s good. One of my original 365 friends has just come back on this site & he’s taken up the challenge of the www.walk1000miles.co.uk challenge. Sounds a lot but only 2.7 miles a day. Just a commitment every day for a year! You can send fir a free pack apparently! @happypat thought I would have a go as well...tried last year but had so many colds etc that I just couldn't do it! The Angel looks lovely in that spot.. yummy Yorkshire pudding.. what a treat.. you will miss ' The Kiwis' when they return.. they will be back in time for the hay making..
She is lovely. I ended up doing a Sheperds pie..Heather came with the kids..originally was pork chops but only had two..so had to rethink..we went up pub 10.45..and stopped till 1.30!..there was a man playing guitar.he was good..tired tonight. Got my dressing gown on now they gone! So lovely to bring out the old favourites year after year , I hope she has enjoyed being on the dining room this year Your roast sounds good - I just didn't know what to have today eventually decided on Salmon with Hollandaise sauce , nice smooth mash potatoes , peas and carrots - - really enjoyed it ! Lovely angel. Happy New Year. The first dinner of the year is always special in my history! Cold ham, new potatoes from the garden, peas and salad. Very elegant corner of your lounge! What a beautiful angel. A lovely shot! What a lovely cosy corner. The angel looks quite at home there. @onewing That’s all part of it I agree Babs! Memories are very strong around this time of the year! @maggiemae I believe it’s very warm on South Island today, Alex in Dunsandal says it’s 28c up there, sounds bliss! It’s actually really nice weather here at the moment so no grumbling! Your meal sounds perfect fir a summer New Years Day! @beryl Yes we had salmon & salad yesterday, I really enjoyed it....something light & fresh! Beef went down we,l they have just gone, sad fir daughter to say goodbye to her brother, she misses both her brothers! @brennieb That was well worth it then Brenda your trip out to the pub, nice to have company on NYE. Wev3 had a great evening, said goodbye to Jack too Just in case we don’t see him again before Saturday. @julzmaioro We will miss them indeed but think they are ready for back now, things calling from home! Lovely to have special treasure decorations with stories. Wishing you all a wonderful new year to explore and enjoy. 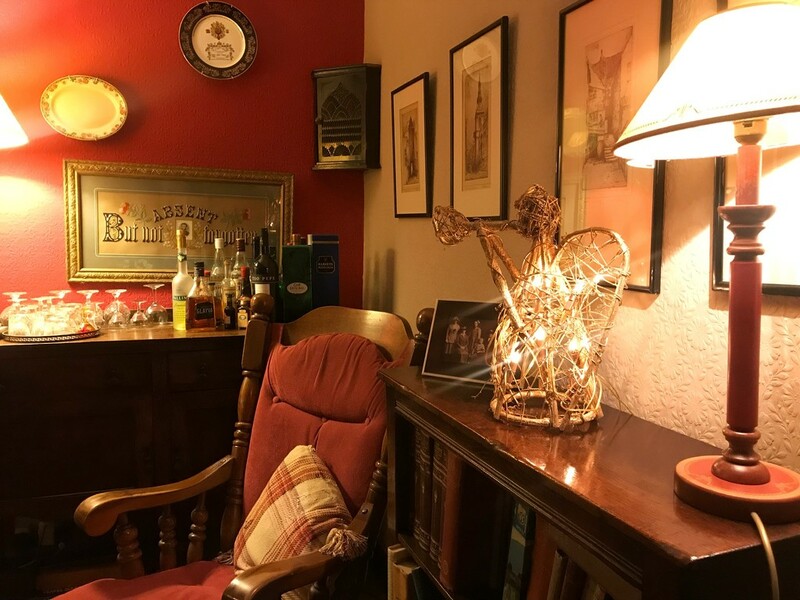 Your dining room corner looks like a Jackanory corner, tucked away in a proper wooden beamed old pub with an open fire - what a lovely relaxing atmosphere. She glows as beautifully as your warm looking room. We have two old paper lanterns from our first year of marriage that are also just hanging together but still have pride of place.